Pomegranate Sangria: the perfect fall sangria for any party! This Pomegranate Sangria is bursting with fresh, seasonal fruit and is so easy to make. Perfect for holiday get-togethers! Sangria was my gateway to wine. While wine was sour and astringent, sangria was sweet and fruity and basically the grown-up grape juice of my dreams. Needless to say, I still love sangria, especially as a way of using up seasonal fruits! But just because summer is over doesn’t mean we have to stop enjoying our favorite fruity elixir. 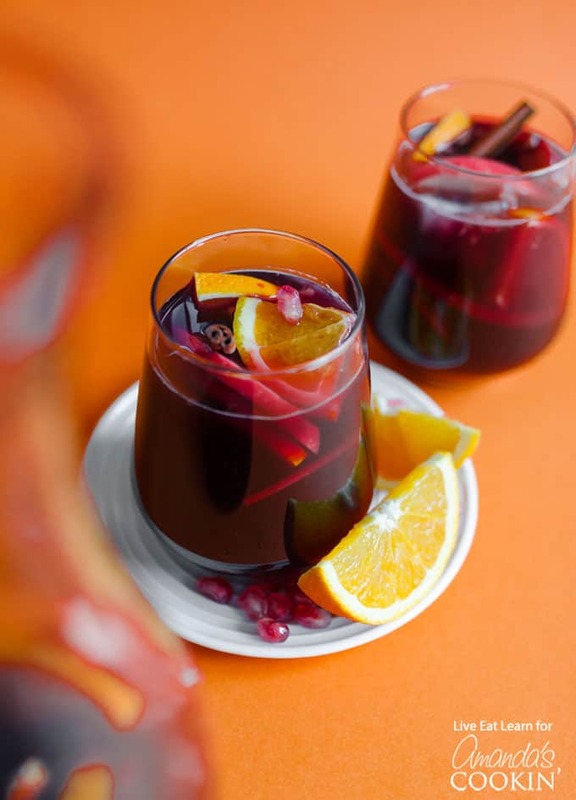 This Pomegranate Sangria recipe is filled with seasonal flavors, like citrus and cinnamon, making it the perfect drink to serve up at your next holiday get together. 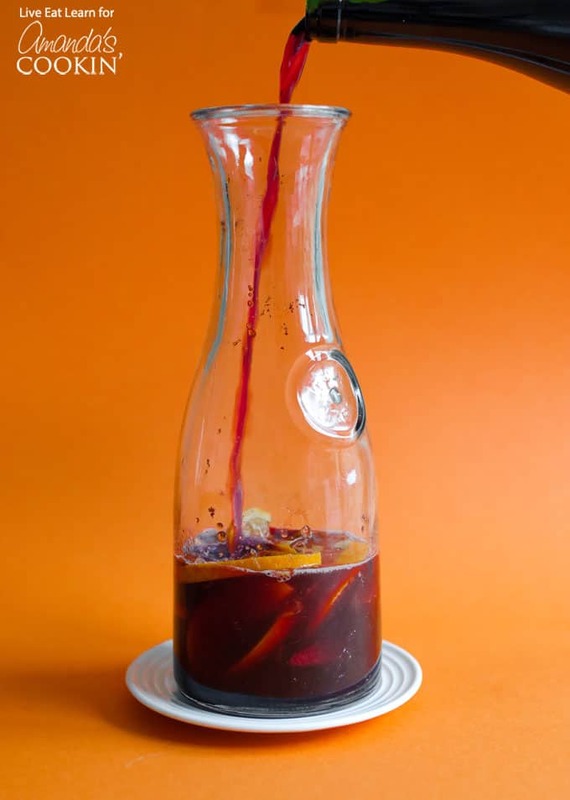 To make this Pomegranate Sangria, you’ll add your orange and apple to a large pitcher and muddle them for 30 seconds or so to get the flavors moving (I like to use the end of a wooden spoon for this!) Then you add the juice, brandy, and brown sugar, and muddle once more. Then add in your wine, pomegranate seeds (learn how to deseed pomegranate), and cinnamon! Let it chill for a few hours in the fridge to give the flavors some time to come together, then serve! In the mood for more fall cocktails? 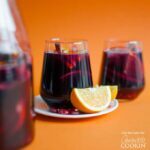 You may also like this Autumn Apple Sangria (basically apple pie in a wine glass) or this warm and cozy Blueberry Gluhwein. We love a good sangria here on Amanda’s Cookin’. 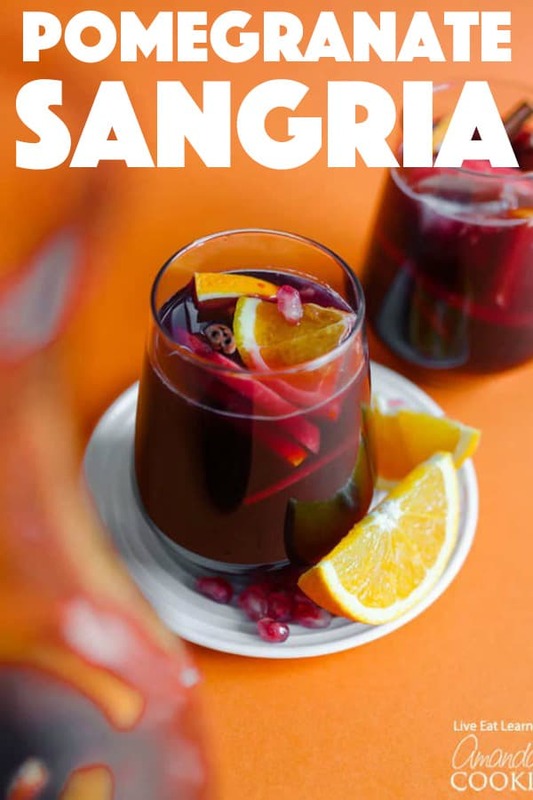 Whether it be cranberry sangria, strawberry kiwi sangria, white sangria, or Mexican inspired sangria we always love more delicious ways to whip up a sweet dose of sangria! 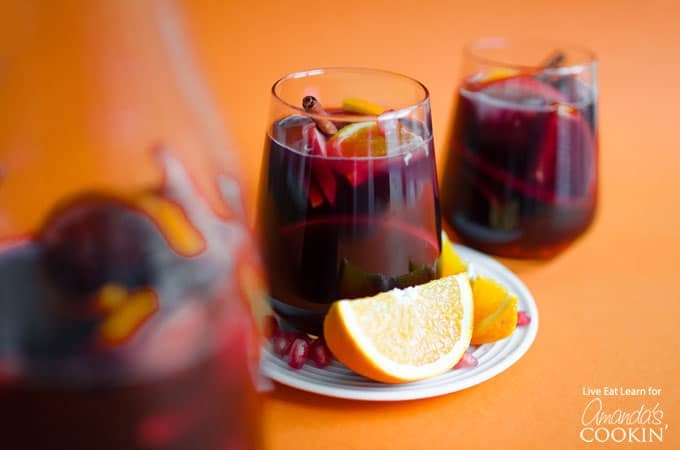 What’s your favorite type of sangria? Want another delicious fall-inspired cocktail? 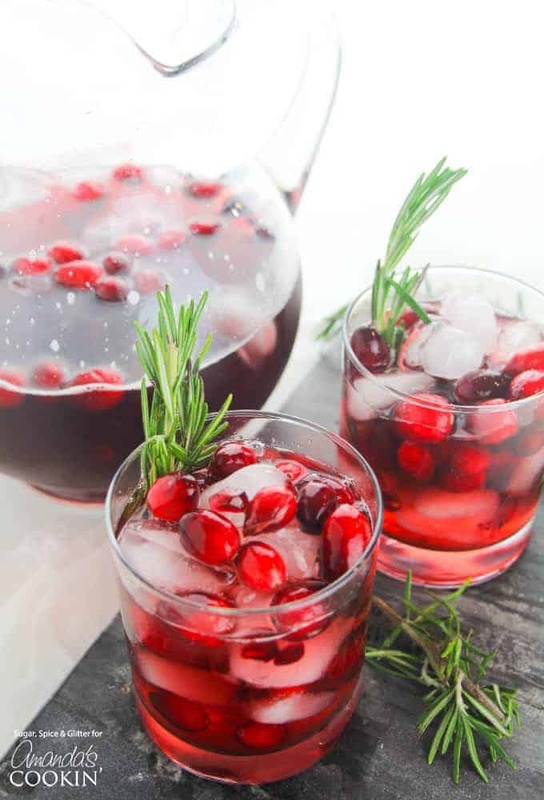 Our Cranberry Holiday Punch is perfect for your festive parties. Whip it up for your Thanksgiving gathering or a Christmas party! 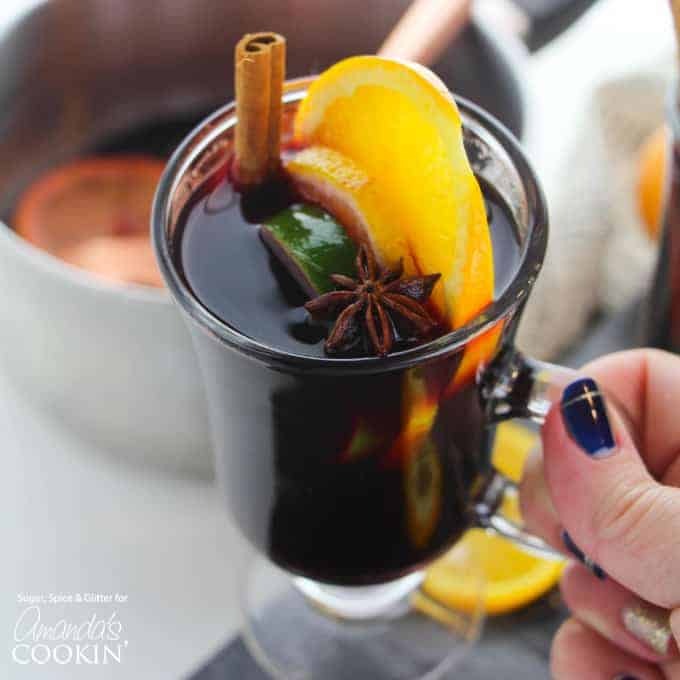 And another classic holiday drink is Mulled Wine. A tried and true festive drink that many have enjoyed for years. Enjoy the aroma while it cooks, and enjoy the taste when it’s finished. Great for Christmas or holiday parties as well! This Pomegranate Sangria is bursting with fresh, seasonal fruit and is so easy to make. Perfect for holiday get togethers! Add orange and apple to a large pitcher and muddle for 30 seconds with the end of a wooden spoon. Add in pomegranate juice, brandy, and brown sugar. Muddle for another 15 seconds. Add in wine, pomegranate seeds, and cinnamon. Place in the fridge for at least an hour to chill. Serve cold, optionally over ice.